Is your carpet toxic? | That's Bad For You! Carpet can serve great purposes like keeping your room warm or making it pretty and colorful. “Over 60% of homes in the USA have carpeting” (Natural Living). Children love carpet. 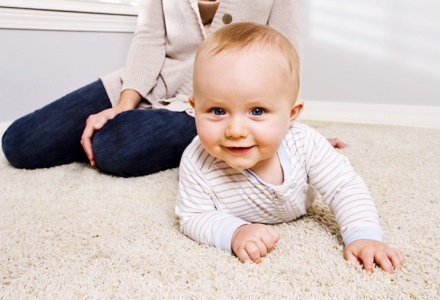 Infants crawl on them and people seem to have a thing for that ‘new-carpet smell’. Little do we know, we are being poisoned by the chemicals, allergens and toxic dust in our carpets. Did you know that your carpet can hold 8 times it’s weight in toxin filled dirt? According to an article in Natural Living, older carpets are so toxic that your chances of being exposed to hazardous chemicals are 10-50 times higher in a carpeted room than outdoors. If the carpet is plush or shag, your risk increases substantially. Not only do they contain the chemicals banned from more recent production, they also have had years to accumulate pounds of dust mites, dirt, pesticides and other toxins brought in on shoes, feet and pet’s paws. The article goes on to say that new carpets contain ‘volatile organic compounds’ VOC’s. These include toluene, benzene, formaldehyde, ethyl benzene, styrene, acetone and many other chemicals, some of which have already made the EPA’s list of Extremely Hazardous Substances. P-Dichlorobenzene, a known carcinogen is in new carpets, and there are also chemicals that have shown to produce fetal abnormalities in animals. Hallucinations, nerve damage and respiratory illness are just some of the effects that these chemicals cause in humans. Let’s all say it, “That’s bad for you.” So learn how to reduce your exposure to toxic carpets! This entry was posted in BAD, Bad For No Reason, Nasty and tagged allergens, carpet, chemicals, EPA, ethyl benzene, nerve damage, styrene, VOC's, volatile organic compounds by thatsbad4u. Bookmark the permalink.